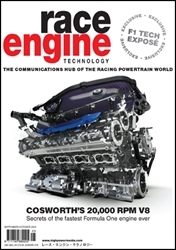 16 issues of Race Engine Technology magazine delivered anywhere in the World. Race Engine Technology has established itself, and continues to be, the communications hub of the racing powertrain world. Its incisive analysis reveals secrets of performance. 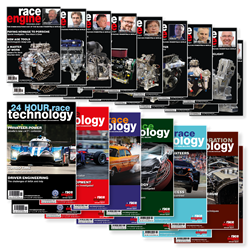 Edited by Ian Bamsey and his team of the best motorsport journalists, the magazine contains in depth research insights probing significant contemporary race engine projects. In addition comprehensive coverage of all new developments and revealing interviews with those central to the on-going evolution of technology. New Subscribers - just click 'BUY NOW' and follow the instructions. Renewing Subscribers - just click 'BUY NOW' and follow the instructions! We automatically check every subscription bought through this website so if you already have a subscription we will update the existing one, you will not receive duplicate issues, the subscriptions will run consecutively.